Never adjust the steering wheel while the vehicle is moving: Adjusting the steering wheel while the vehicle is moving is dangerous. Moving it can very easily cause the driver to abruptly turn to the left or right. This can lead to loss of control or an accident. To change the angle or length of the steering wheel: 1. 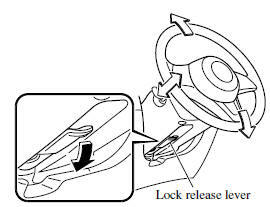 Stop the vehicle, and then pull down the lock release lever under the steering column. 2. Tilt the steering wheel and/or adjust the steering column length to the desired positions, and then push the lever up to lock the column. 3. Attempt to push the steering wheel up and down to make sure it's locked before driving.